Please help me!! I wan't to play with my friends. Something that may help, I am not using the official Minecraft Launcher (If that has anything to do with my problem), I am using TerraminingMC Launcher Mac OS X version.http://terraminingmc.com/Launcher.html － Link Any help would be greatly appreciated!! Plz help me!! Your serves has to have SAME mods installed (except rendering mods like OptiFine or minimaps, but all shown mods should be OK), and your server has to be FORGE server. You cannot use blocks or items from mods on server, which has no idea what the blocks are. The reason why singleplayer works is because your CLIENT setups the "server", so having the mods installed. You just need to find some tutorial with installing Forge server, as I know, this web is not supposed to be technical help for mods, it should be considered about gameplay. 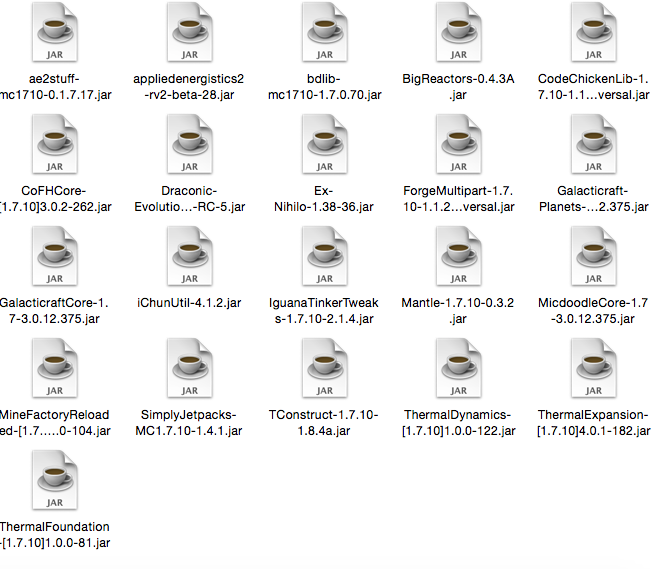 How do I install a .jar Minecraft mod on a Mac with OSX Maverick? I can't log into my own bukkit server? How do I become OP on my minecraft server? It won't let me!